Muhammara (pronounced moo-hum-mara) is a popular Syrian Shami dish that is served as a Mezza, ie, appetizer. Its literal meaning is “reddened” which refers to the reddish color of the dip that comes from red peppers. It is quite simple to make, yet quite rich in taste, and mezza lovers would rejoice over it. There are a number of variations to preparing a successful and tasty Muhammara, and in this post we’re featuring a recipe that we adopted from different recipes and fine tuned to the ecstasy of our taste buds. Thanks to our friends Nabil and Souheila for sharing their version. Roast the peppers in the upper layer of the oven (closest to the flames) at high broil, for about 8 minutes. Turn them every 2 minutes so they don’t char too much. Once done, peel away the charred skin and remove the seeds. Drop the peppers in the food processor, along with the other ingredients and let it spin for 7-10 minutes. The texture of the dip should be a grainy paste. Pour in a serving bowl, garnish with a bit of walnuts and a sprinkle of olive oil. Serve warm or cold with toasted pita bread as a dip. 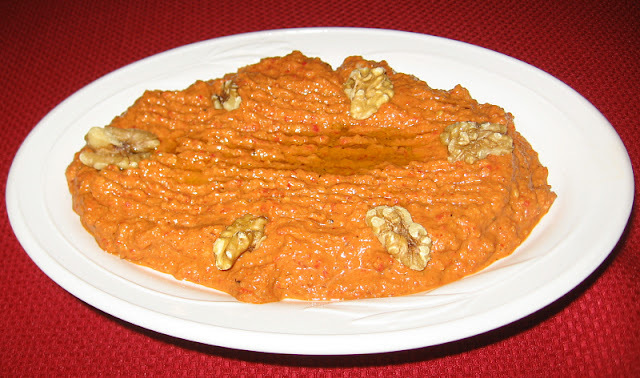 Muhammara is usually served as a Mezza appetizer, along with other Mezza dips and dishes. PS. The leftovers last 2 to 3 days in the fridge. We were surprised to find in a Lebanese cooking book the suggestion to use chilli peppers instead of red peppers, and to soak them in hot olive oil instead of roasting them. Another variation is to use raw red peppers instead of roasted ones. You could also add with the mixture a couple of roasted red hot chili peppers. If you end up trying either variation let us know how it turned out. Have you ever tasted a Muhammara prepared with Chili peppers, or with raw red peppers? If so let us know which was your favorite and feel free to share tips and advice to other readers in the comments section below.